What a great weekend to be living in the Pacific Northwest. For me the adventure started out in Gig Harbor to meet a new friend and then I drove to Bellevue to look at a used car purchase/trade, which I set up on Craigs List. We dealt with Trend Imports. A vehicle for vehicle deal was made and my Durango left behind. This is our second two-seater ZENN (Zero Emissions No Noise) and both of them were purchased in Bellevue. I guess Boeing engineers and doctors have the money to save the environment. Ara Manoogian, the owner of Trend Imports, was a little bummed out with the deal. He had been driving the all electric vehicle to work every day. His son had set up the negotiations. Peg picked me up and was rewarded by Ara with a gift of cigar bands for her art projects. Ara moved to the U.S. from his native Turkey in 1967. He's in the process to stop smoking. I think he constantly has a lit cigar in his mouth. Peg and I drove south to Tacoma where we made arrangements to have ZENN #2 towed (driving range is about forty miles) to its new home and then we were off to the Fairfield Inn (the Marriott hotel in downtown Puyallup). The adventure to Puyallup showed up on our radar when we found out that our granddaughter Bailee was marching in the Daffodil Parade. 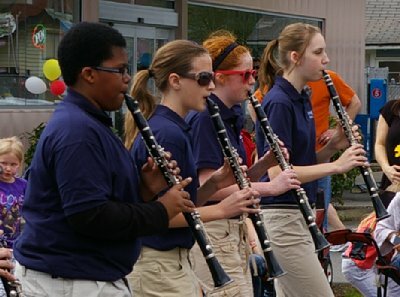 Although I had marched in three of them as a member of the Clover Park High School concert band (baritone saxophone), I had never seen the parade as an adult. As I student I mostly looked at the girls. As an adult I admired the spectacle, the music, the beautiful day . . . AND the girls. We were thrilled when we were able to still grab a room at the hotel on a very busy weekend. A small stream runs in front of the Fairfield and when we were last there, green buds of spring were just beginning to show. This trip the leaves were starting to paint a relaxing beautiful secluded view that's virtually hidden from the road. Like most of the Puyallup Valley, there is beauty almost everywhere . . . even when you aren't able to see it. On the fairgrounds of the Western Washington Fair (The Puyallup Fair to most of us), there is a small fenced pond that is a refreshing oasis in the middle of a parking lot. I love the Pacific Northwest. Although we had a King Room, the view faced south and over the parking lot. It's a nice parking lot, but the view north from the Double Queen Suite we had on our first stay, is much more appealing. From that room perhaps we could have watched preparations for the Puyallup leg of the Daffodil Parade. 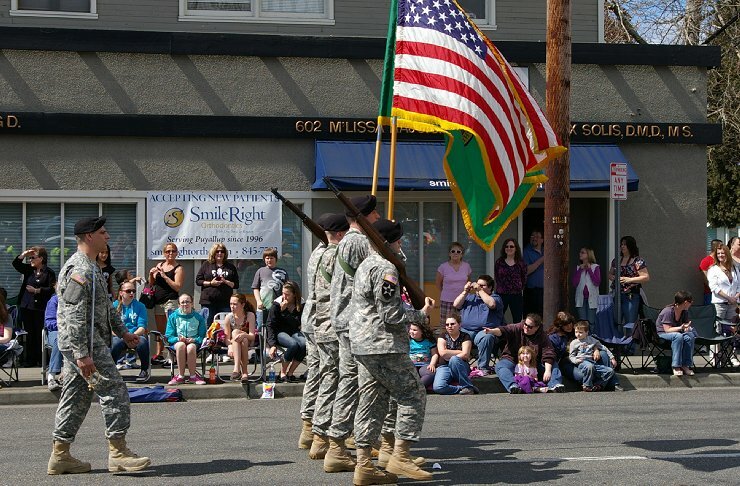 The parade begins in Tacoma and then moves on to Puyallup, then Sumner, and then Orting. Some units drop out and some units are added as the parade progresses from city to city. Peg and I were lucky on our drive back from Bellevue. Traffic is horrible almost every afternoon and Fridays deliver the worst bumper to bumper movement. We never came to a complete halt, which was surprising. I had to stop several times going north, but with Peg we flew in the HOV lane until we jumped to a side road once we passed Auburn. We drove to King's Towing Services and dropped off the car keys. Jose Estrada sent his flatbed tow truck north for our ZENN. Jose is a client. 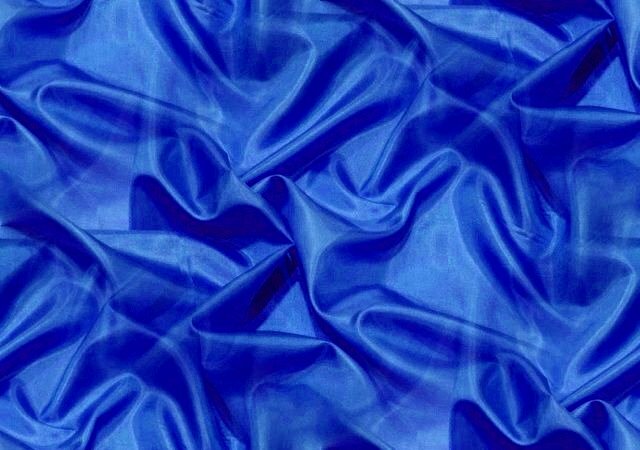 We built his original website and are now expanding the website to keep up with his growing business. He now does auto repair and auto body repair in addition to towing. Back in Puyallup we decided not to buck "rush hour" and chose instead to head east instead of south for dinner. We had seen that Alfy's Pizza was voted the "Best Pizza and Salad Bar," and so we thought we would give them a try. 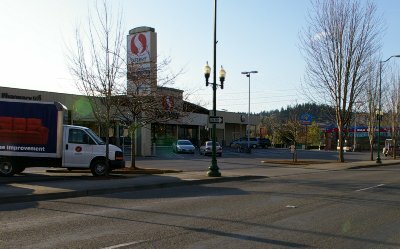 Located on East Main in the downtown area of Puyallup, we drove past it and then made a U-turn and came back. I was a little worried when we entered the tiny restaurant (How could they serve a salad bar and all you can eat pizza? ), but the staff made it work. Peg had the salad and pizza bar, while I had spaghetti and meatballs and a small salad. 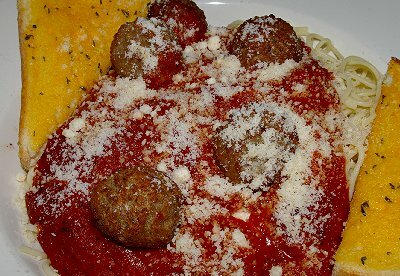 The salad was good, Peg's pizza was good, my meatballs were good, and the spaghetti was good. I would have preferred less sauce. The service was excellent. Saturday morning saw me up and about and trying to figure out the best location for us to watch the parade, which travels down Meridian (the main street in downtown Puyallup) for several blocks. I drove to Safeway looking for a notepad and saw instead information about parking. Their parking spots along Meridian were available for a donation. At least that's what the sign said. However, no one inside the store had details. The donation idea was put into action by the new store manager. I saw where I wanted to park. I had money in my pocket and was eager to make a deal. I just had to figure out what I could do and put together a back-up plan in case my first option failed. Sometimes I have several back-up plans. I believe in fall-back positions. As I drove back to the hotel, I saw a taxi cab at Cattins. It was time for breakfast, so I pulled into the parking lot and then took a seat in a booth. Looking down the counter I saw a long-bearded man with a Bluetooth earpiece. He was drinking coffee. As the waitress took my order I nodded and asked, "It that the cabdriver?" She replied with her own nod. I drank my coffee and waited for him to finish. It turned out his sales area was Ft. Lewis. Darn it. I had been making plans to park and be dropped off around town kind of like Matthew McConaughey in The Lincoln Lawyer. Peg and I would be the Checker Writers with our own private driver. Oh, well. While I finished my meal three men with reflective vests came in a took a booth just two down from me. Printed on the vests was the magic word, "Kiwanis." I knew they were involved somehow with the parade. I paid for breakfast with my Saturn Barter card, which the waitress showed to a second waitress who then came over to my booth. Waitress #2 had questions about Saturn. I think she wants to join. After she left my table, I approached the Kiwanians and explained what I was looking for. They told me that they were directing parking at the "Gold" lot (part of the Western Washington Fair property in downtown Puyallup). One man remarked that I could have his parent's two spots on the sidewalk because they were on vacation and missing the parade for the first time in decades. I laughed and thanked him. I didn't have everything worked out, but by the time I walked into our hotel room I had a plan and a back-up plan. That's not bad. I checked my emails, read USA Today, and made notes to myself while Peg slept a little longer. We arrived at just the right time in the parking lot of the Safeway store. There were two open slots. We paid ten dollars and parked between a red truck and a white van. Peg hadn't eaten, yet. A nice young man (the son of the new Safeway manager) directing traffic in the Safeway parking lot directed us to Darren, his father (the husband of the new Safeway manager) who was running a concession stand. The parking lot donation and the concession stand profits were all going to a local disabilities group. Since I have been board chair and am currently still a board member of TACID (Tacoma Area Coalition of Individuals with Disabilities), I have no problem handing out money that benefits one of my favorite charities. I brought hot dogs, cookies, and water back to the car for a picnic. 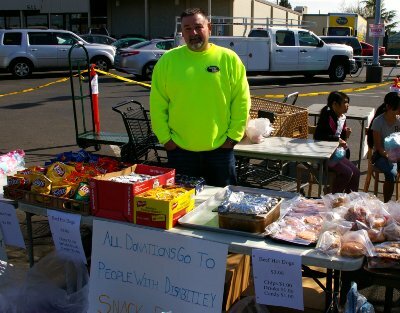 Like Safeway and Kiwanis, there are many non-profit community organizations that work all they can to earn a few more dollars for the community. Sitting in our car we saw vendors walk up and down the street offering gee-gaws left and right. I saw inflatable hammers, wizard hats, balloon yo-yos, and cotton candy being hawked everywhere. Next door to our parking spot, a family was busily getting a wagon ready to offer colorful Hawaiian leis to the growing crowd. 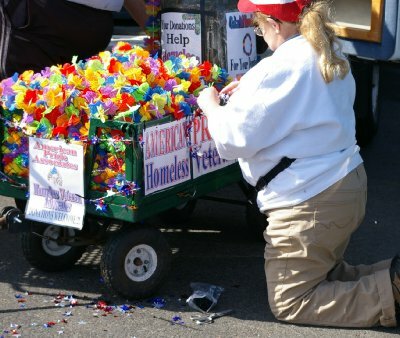 The monies from the lei sales would help homeless veterans. By the time the parade started, the driver of the van had changed into a Captain America outfit to catch the eye of potential customers. He later mentioned that if he had know we were going to pretty much stay in our car, he would have let us sit in his van, which sat up another foot or two to give a better view of the parade. Nice people. 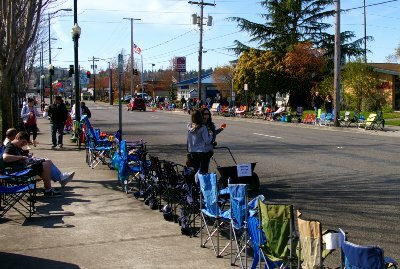 The parade route would close the main street in downtown Puyallup (Meridian) and pass popular Pioneer Park. We arrived about nine-thirty and scoped out the porta-potties and soon the streets were filling up on both sides. People gathered on the sidewalks and constantly crossed the street to visit with friends. Local restaurants were open and many stores were open as well. I went shopping at Ace Hardware, where I got great customer service. Just down from Ace was a Japanese restaurant, which I thought Peg might want to visit as the day went on. 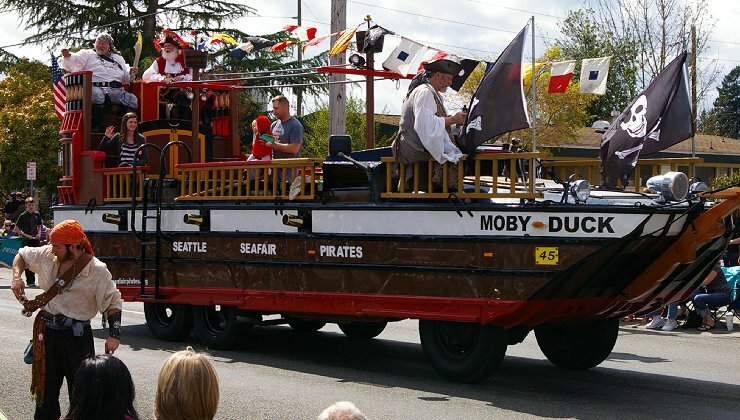 The parade started in Tacoma at 10:00 AM, but wasn't due to start in Puyallup until 12:45. 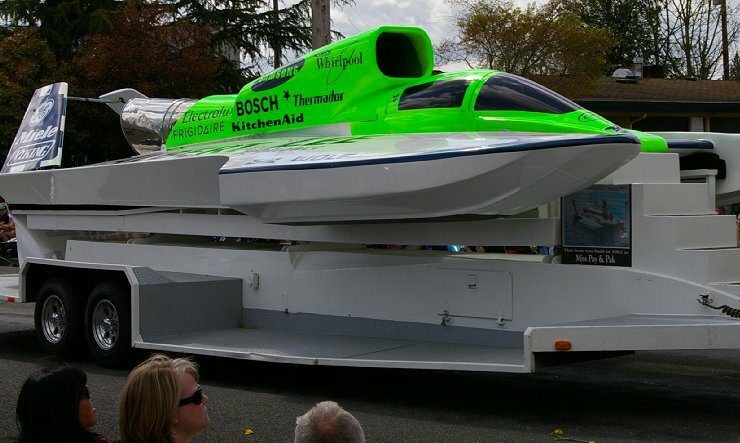 As soon as floats completed their route in downtown Tacoma, they drove out River Road along the Puyallup River. Floats don't travel very fast. Visibility is a slight issue, but the possible loss of hundreds of daffodils is always a main concern. The list of parade units was about five pages long. Bailee's middle school was listed at #80 (third page). My guess was that we would see her about 1:45. I don't know what time people started showing up, but empty chairs were everywhere even with people milling about. I think it was like the shoemakers little elves. They delivered comfortable chairs and left. People showed up later via foot, skateboards, and bikes to claim the empty seats. I think they had done it before. Peg was tired, so I suggested that she recline the Buick's front seat and take a nap. She had books and magazines to read as did I. Filling time was not hard for us to do. If I could have found a cab, however, I could have sent Peg to her favorite book store, which was about five blocks away. That's not far, but it's further than Peg wanted to walk . . . me, too. One block away was the Farmers Market. I left Peg and hoofed it a few hundred yards. The market is located in Pioneer Park, which was filled with people. I took a bench seat a few feet away from the Rotary donated stage and jotted down some ideas and played a game of "people watching." There was a constant stream of people past my bench. Mothers with baby carriages and kids in tow. Couples walking arm and arm, and older people with walkers and canes. The whole city was turning out for the big parade. I saw three young princess types. 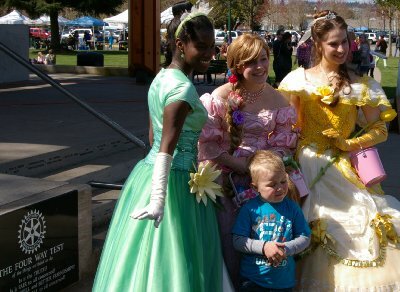 I first thought they were Daffodil Royalty, but then I realized that the Daffodil Queen and her court were probably still in Tacoma. I was probably looking at representatives from other festivals. The three girls were very friendly and gave their attention to everyone who approached them or asked to have their photograph taken with them. If I had posed with them, I would have looked just like the little boy in the blue shirt I saw them with. He had a "oh, well let's just get-it-done look on his face." 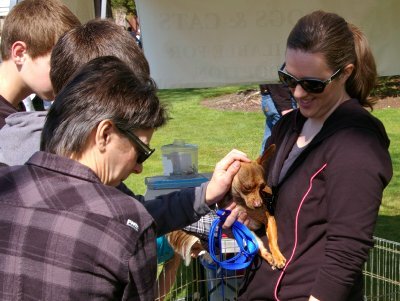 There were quite a few dogs in the park along with their owners, but a constant crowd surrounded the Dog and Cat Rescue people. They had puppies and kittens for adoption. There were so cute . . . both the pets and the volunteers. Pioneer Park is one of the best ideas Puyallup community leaders have ever come up with. The Farmers Market does well, bringing people to downtown Puyallup to buy everything from prepared food to fresh fruit & vegetables. Flowers and plants are also available along with clothing, art and many kinds of do-dads. If you get tired of shopping at the Market you can always socialize, enjoy an occasional stage show, smell the roses AND enjoy the art. 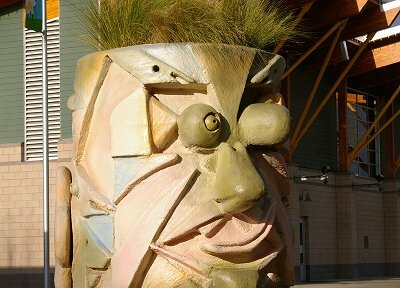 There are many sculptures within the park and along the streets of Puyallup. It's a joy just to look around. Normally, I would have been eating at the food booths and admiring the art. It was still a little early for another meal, so I was left with looking at the art. I really enjoyed this piece on edge of the park. It's a combination of Chia Pet, green olive eyes and Native American totem artwork. It brings a smile to my face each time I see it. The wild grass for hair is inspirational. Actually, this is how I looked when I got up at six-thirty. I never tire of seeing my favorite pieces of art in our home and on the streets of Puyallup. It is a little quieter at our home, however. One of the favorite items purchased from street vendors were the vuvuzelas. The vuvuzela is a plastic horn, about two feet long. It produces a loud monotone note. Some models are made in two parts to facilitate storage and pitch variation. I didn't need any variation. I just needed fewer vuvu sellers. In addition to sculptures in the downtown area are local murals. They show what the town and the country side looked like in times past. 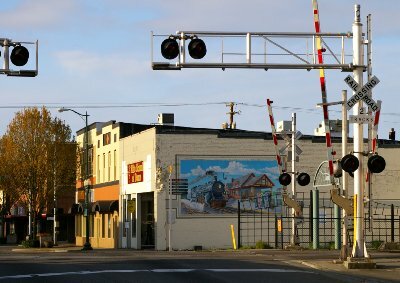 This one with the image of an old steam train decorates a wall by the railroad crossing, which brings traffic to a halt as trains roar through the business district. 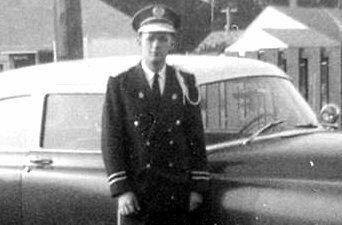 The railroad continues to play a major role in Puyallup. The Sounder stops in Puyallup on its way north to Seattle (and connections beyond) and again on runs south. Parking has been made available in and around the loading platform for commuters traveling to work in King County. Trains seem always to pass through town at the most inopportune times. Sunday morning a long freight stopped my progress for breakfast. The train cars whipped by at the rate of one per second between the flashing lights. That's moving. The parade turned off Meridian before reaching the tracks. Good planning. Our son and his family joined us in the Safeway parking lot for the parade. I had a great time. As I watched the parade I remembered that one of my friends, Paul Hunter, was pulling the Afifi Shrine calliope. He was driving. As I looked at the list of units I realized that my friend Deb Sharbono was riding with her mounted group, the Tacoma Larriettes. I smiled as she rode past. I also saw that Pat McCarthy, Pierce County Executive, was riding in the parade. I've always supported her. I was enjoying myself. I felt connected. As we neared Unit #80, Edgemont Middle School, I walked down the block to get a good look at where our granddaughter would line up in the band. No one knew which side she would be on. As her group rounded the corner I began taking pictures and then would take a fallback position (remember my planning) and shoot a few more until I passed our car and then ran out of steam. Sitting in chairs and standing on the sidewalk were our granddaughter, Laci (Bailee's younger sister) and our grandson, Riley (Bailee's younger brother) along with their cousin Marin, and other grandparents Brent and Nancy plus our son Patrick and our daughter-in-law, Wendy along with their friend Ann. Peg and I enjoyed the Coyote Unicycle Club as they passed on their one-wheeled pedal machines. 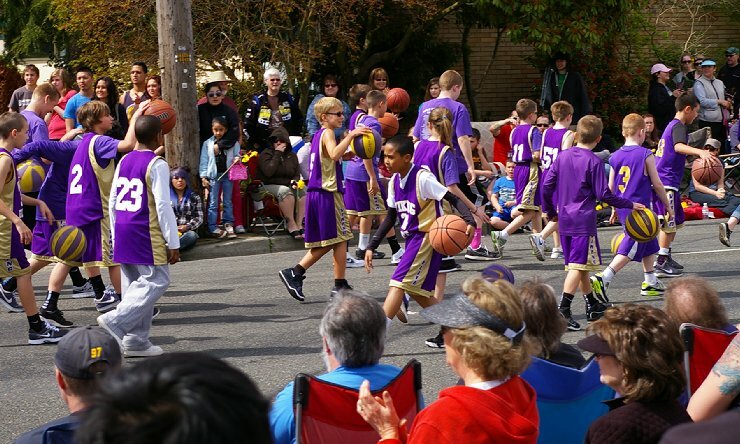 We also got a kick out of the Puyallup High School Basket Ball Camp members who dribbled their balls down the street, as well as the Jazzercize group, which danced sideways, backwards, and forward along Meridian. Those women had to be dead tired when the day was over. I was tired just watching them. 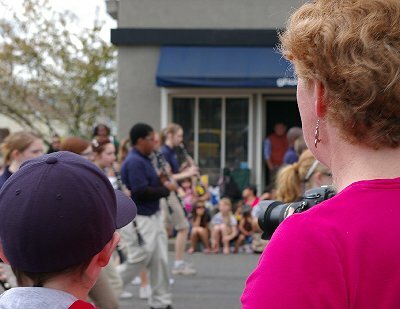 As we saw all the different high school bands pass us by, Peg said, "I wonder if Caitlin is going to be in the parade?" We looked at each other. No one had mentioned this possibility to us. I looked through the parade list and there was Franklin Pierce High School. Peg called Caitlin's parents and they said that she would be marching with the band. Her group was listed at #95. 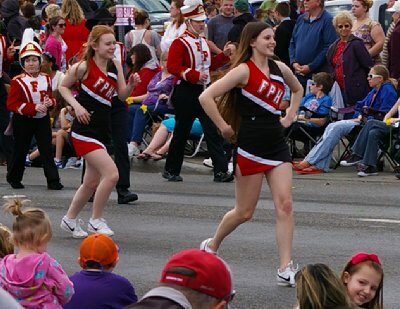 Caitlin with her long, long hair and her fellow cheerleaders led the band down the street. Just as I had done with Bailee, I hustled down the street to get a first-look to see where she would be. She was one our side of the street and doing a routine as they marched. I took several pictures and retired to the car where Patrick was ready to shoot more photos. As Caitlin passed by, Peg shouted her name and Caitlin turned and waved. I think she was surprised we were there. What the heck, so were we. We loved the Safeway lot as a place to park. Peg and I decided that next year, we'll try to reserve three parking spots and prepay. It made life so much easier being able to have our car right where we were. Next year, we could all caravan beside each other and have chairs set up and tail-gate . . . well, maybe not. The parking lot option opens up all kinds of possibilities. Both Caitlin and Bailee will probably be marching again next year. 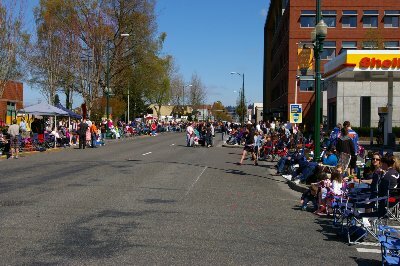 The problem with watching the parade in downtown Tacoma, is that you can't really get close without walking quite some distance, and then you have to walk back up the hills. In Puyallup the distance isn't as great, the terrain is flat, and the additional convenience of a car gives us the convenience of easily taking shelter in case of rain, which it has been know to do here in the Pacific Northwest. 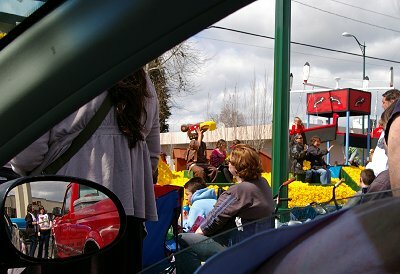 As it was, the parade was held on a very beautiful day, but the car made it more comfortable. I turned the car on several times and used the air conditioner. I like my comfort. After the parade Peg and I were hungry. Friday on the way to Puyallup we had seen a Thai restaurant in a little strip mall. 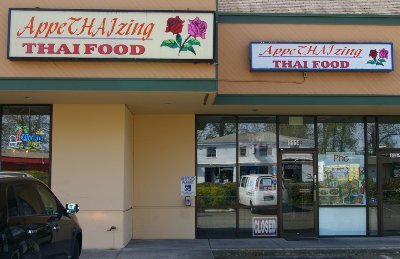 The restaurant name caught our attention: AppeTHAIzing Thai Food. The restaurant was completely empty. The owner was warm and welcoming. The menu looked good and the prices were excellent. Each item was a couple of bucks below what we would expect in similar restaurants in Tacoma, even if they weren't appeTHAIzing. The three flavor trout wasn't available, but the crispy duck was. Peg ordered it. I ordered a green papaya salad to share. I still remember the green papaya salad in Hawaii. Yummy. I ordered the Pad Thai with prawns and tofu ($8.95 plus the tofu). Peg's Thai beer and my root beer were both served in a frosty mug and went down so nicely. The papaya salad was only okay. Unlike the salad in Hawaii, which only had fresh lime juice squeezed over it, this salad was dressed. It just didn't have the zing. My Pad Thai was write-home-about good. The prawns were slightly under-cooked perfectly and the tofu was flavorful with little pieces throughout the noodles. 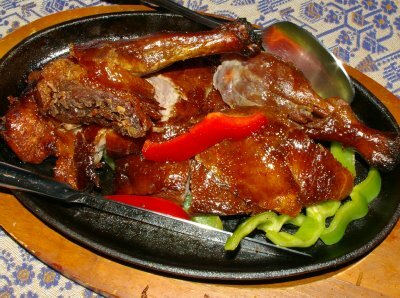 The crispy duck was delivered to the table sizzling on its platter. The duck skin was crispy. Crispy and tasty. Crispy, tasty, and worth much more than the $13.95 (the most expensive item on the menu) it cost. We never even touched the brown rice it was served with. The Hosin sauce and chili dipping sauce were not hot, but added just the right spice to the dish. Fresh spinach and red and yellow peppers accompanied the duck. Peg and I have a couple different groups of people we need to inform about this place. I would eat there again . . . frequently. The owners took over the running of the restaurant about a year and a half ago. 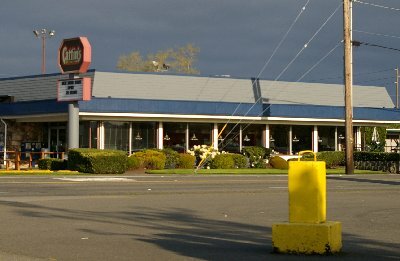 The restaurant has been there about eight years. Check it out. Back home, I found a review on the internet, "Great! With the new owners the food is 1000x better." I don't know about the food before, but I know how good it is now. I let Peg sleep in late on Sunday, while I went out for breakfast. 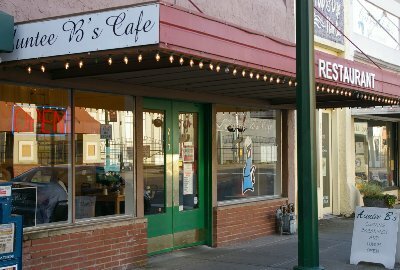 In one of our earlier stories I had commented about breakfast places in and around Tacoma. Mrs. Turner's Hometown Caf� in Puyallup was recommended by a number of people, so thought this would be a good chance to sample their menu. The big sign on East Main should have been a warning, "EXP COOK NEEDED." I ordered the chicken fried steak with my hashbrowns "burnt, burnt, burnt . . . with an onion cut up in them." The waitress, a nice looking college type, was friendly and efficient. My food was served fairly quickly, a bad omen. The hashbrowns were a little darker than hashwhites, but nowhere what I asked for. The waitress stopped by and asked how everything was. I said, "Fine except for the hashbrowns." She offered to have them recooked, but I declined. In the menu the gravy had adjectives that made it sound worth eating. I sprinkled it liberally with pepper to give it some color and taste. Neither worked. 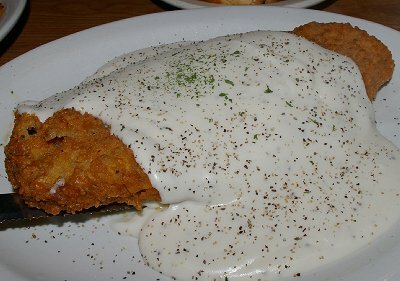 The pasty white gravy, which had to be from a mix was horrible. The chicken fried steak was okay, but had to have been microwaved. It got hotter as I cut into the center. The sign said it all "EXP COOK NEEDED." I left most of the steak and gravy. I was disappointed. Who would recommend this place? Maybe it will get better with a new cook. Who knows? I drove away and decided I needed to get the bad taste out of my mouth and my mind. I drove a few blocks away, which turned out to be a whole cooking world away from Mrs. Turner's Hometown. I parked right in front of Auntee B's Caf�. 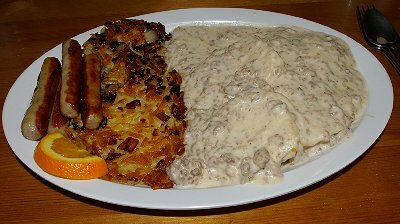 I ordered the biscuits and gravy with sausage links and hashbrowns (burnt, burnt, burnt . . . with an onion cut up in them) from Sandy. The cost of the meal was about five dollars less than the Hometown. The clientele looked a little older than that of the Hometown, but there were a few younger people as well. The Caf� is larger than it appears from the street. The tables were uniform, the wood flooring was worn. The atmosphere was warm. I watched Sandy sit down with a group of people in the corner so she could write up their order on the table. An older gentle man filled up my coffee cup. I liked the look of the wall and so I asked him about it. The plaster had been removed in the corner which revealed the weathered brick wall of the building next door. It looked like the job of de-plastering just stopped when the brick wall was reached with its painted on advertisement. I don't know what it was selling, but I was sold on it. It gave the place a comfy feeling. My server said that people ask about the wall all the time. One customer even said he would research it, they never heard any more. 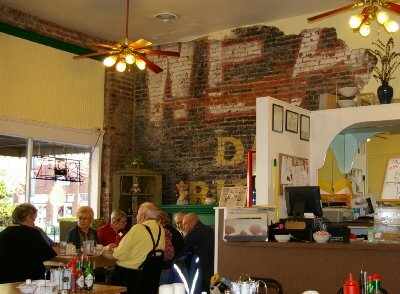 The new owners have been operating the Caf� for about five years. If there was a pot-bellied stove, the place could pass for a restaurant in some of the old black and white movies of the 30s and 40s. Auntee B's is only open for breakfast and lunch. Waiting for my food I just had a feeling that the food would be "just right!!!!!!!!!!!!!!!!" It was. The menu had used no adjectives other than "sausage" to describe the gravy. They could have used "scrumptious." There were chunks and chunks of sausage. The gravy was like I would make it. The hashbrowns were delivered, not burnt, burnt, burnt, but the dark brown hashbrowns was interspersed with blackened pieces. Mixed with the gravy it was what the Hometown should aspire to. The biscuits were better than most, and I even ate a two or three halves. However, my guess was that they weren't homemade. When I paid my bill, I asked Sandy, "Was the gravy homemade?" Her reply made my day, "I can't stand anything out of a can." "What about the biscuits," I continued. She said, "Food Service of America. We just can't make the biscuits, too." I understand and don't blame her. I've had what people claim were homemade biscuits and they should trade them in for the same brand that Sandy buys. They were okay. They weren't Doman biscuits, but they were okay . . . and that's not just faint praise. I went back to the hotel and read the Sunday paper and busied myself until Peg woke up. We packed up and headed back to Tacoma, but we had one more stop to make in Puyallup. I've remarked before that the Puyallup Valley used to have little produce stands all over the place. 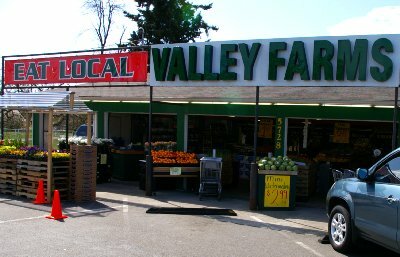 Each farm would offer their own homegrown fruits, berries, and vegetables for sale. The Farmers Market has taken over some of that ability to sell local produce, but there are getting to be fewer and fewer farms. One of our favorites is run by Duris Farms. They always had raspberries and cucumbers, but it's still too early for those. 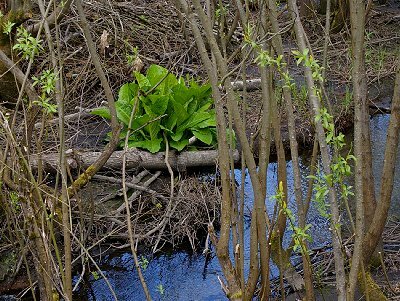 Peg and I had spied another on River Road just down a ways from Duris. We got there about 11:30. Three or four cars were parked in front of the stand. We pulled in and added our Buick to the row. While Peg walked over to shop, I walked over to a small blossomed-filled cherry tree. 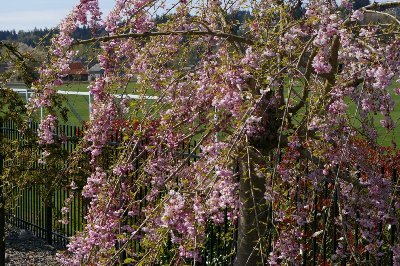 It was in a row of other fruit trees, which overlook a soccer field. I think Peg and I have watched grandkids play there before, or perhaps it was our own kids who had played there. 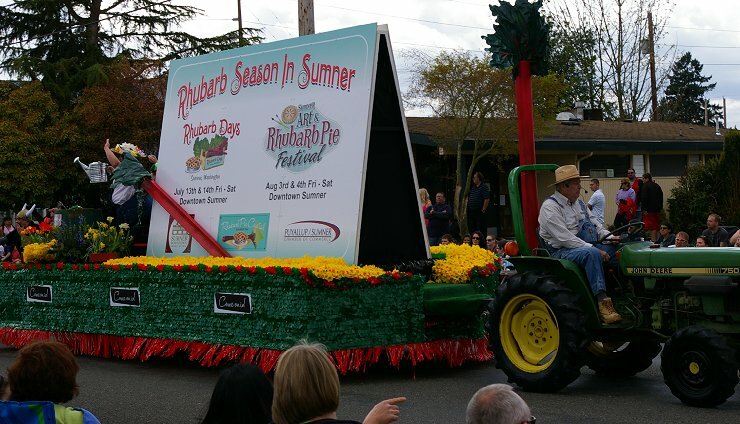 The Puyallup Valley is a great place to raise food, both animal and vegetable, and it's a great place to raise kids. A soccer field and a baseball field can do that. I've never lived in Puyallup, but my aunt and uncle and cousins did. I slept over night there many times. I played games in an old berry picker shack and I've picked my share of berries, too. My aunt and uncle have passed away along with two of my cousins, while the other two live thousands of miles away from each other and me. I miss them all. Each time Peg and I visit Puyallup, I think of them. 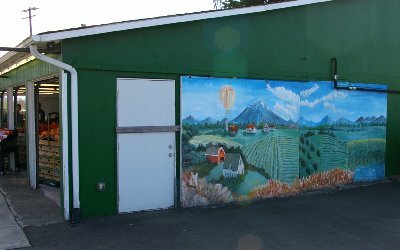 On the side of the produce stand is another mural. A great greeting for people traveling from Tacoma into Puyallup and nice goodbye gift for those leaving Puyallup. The mural shows Mt. Rainier and farms in the Puyallup Valley. Mostly memories. I found Peg choosing some good fresh food for us. I of course went the other way. I passed on the sausages in the cooler, but spied something called Pepper Elixir, which was supposedly infused with good luck. The Pepper Elixir is from a soda firm in Mukilteo. I may have to visit them. I was a little afraid that the pop would be spicey. I've had a couple ginger beers, which had a spice that kicked the back of the throat. The Elixir wasn't overly sweet or spicey. It, like so many things we experienced on this adventure, was just right! 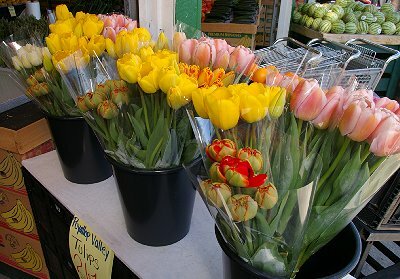 I gave Peg some virtual tulips from the Puyallup Valley. She's allergic to flowers, but loves them and especially tulips. If I had purchased the real ones I would have had to put them in a vase and leave it outside. So, instead I took a photo of them for her. We've never had a bad adventure anywhere and certainly not in Puyallup. I think we will return again and again. There's always something new to experience, plus our favorites. We found two new restaurants, which we'll tell our friends about. We missed a production of Arsenic and Old Lace by a week and we missed being entertained by Little Bill and the Blue Notes by three weeks, but on the whole we had a great time. And next year, we'll be better prepared for the Daffodil Parade. We'll have two granddaughters to cheer for and other friends to wave at. We just need to get the right parking space at Safeway to make it perfect. Puyallup Valley Daffodil Parade, Mrs's Turners Hometown Caf� Puyallup, Auntee B's Caf� Puyallup, Puyallup Farmers Market, Appethaizing Thai Food Restaurant Puyallup, alfy's pizza puyallup, vacation adventure to Puyallup Washington, Puyallup wa washington.